Dia De Los Muertos is a Mexican Holiday where we honor our loved ones who have passed away. As a child traveling to Mexico to visit my grandparents and family, I remember my family celebrating our past ancestors with candles and calaveras (sugar skulls) and bright flowers. I was always fascinated with the sugar skulls, the vibrant colors and respect that the living had for the dead. Lots of food was served, and it was a way for family to honor them and get together for celebation. We create alters with candles and flowers and leave notes and pray for ourselves as well as their souls. As I have grown older, I still love the vibrant colors and sugar skulls and appreciate Target for incorporating Dia De Los Muertos into their seasonal decor. 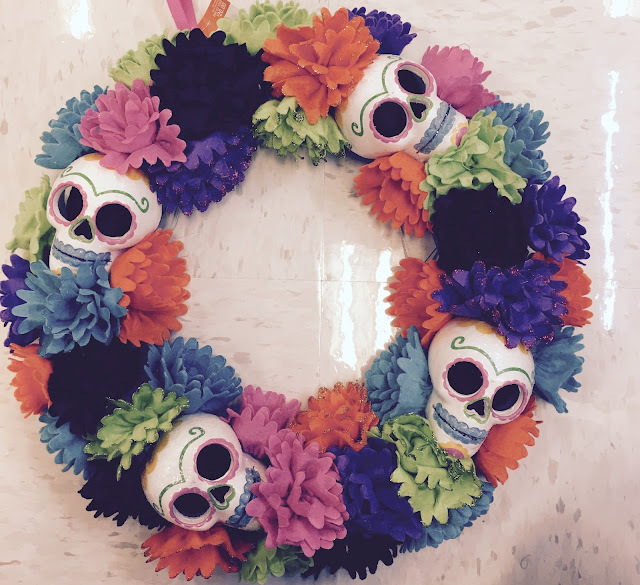 Yesterday, while shopping my local Target I purchased a Dia De Los Muertos wreath that will be hanging on my door for the next month. The wreath has sugar skulls and bright colorful flowers which I really like.